During the 1960s and �70s Helen Peacock of Kamloops worked as a professional fly tier; one of her creations was called the Helen's Heller and the Caverhill Nymph owes its origins to Peacock's creation. In a November 1994 letter about the Caverhill Nymph, Peter says that "this fly was simply a case of lazy misidentification and sloppy fly tying ... I thought that I had been tying a Helen's Heller; however those with greater knowledge and understanding realized this error and had to call it something, [and] they decided to give it my moniker." On the following five days, I was able to estabilsh that the trout did indeed favor the Caverhill nymph. And, even though fishing was slow by standards of previous years, I did manage to hook 16 trout to eight pounds-fishing reasonably hard. To top Kilburn's trip, Joyce, Kilburn's wife, took a 9 �-pounder on a Caverhill Nymph. When I asked Caverhill for a fish story, he referred me to Kilburn's story partially detailed above and noted that the fly was featured in Alf Davy's book The Gilly (1986). "However, the fly must be pretty widely used and appreciated because I'm constantly questioned by new fly fishers that I meet about the Caverhill Nymph," said peter. Twenty years has lapsed since Peter made that fly-tying faux pas, but the fly like the ardent fly fisher and fisheries branch biologist, Caverhill, lives on. 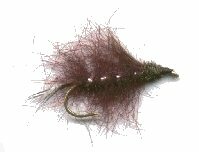 Over the years the Caverhill Nymph has been a popular pattern with BC anglers, as evidenced by the following E-Mail sent to Peter. Hi... Is this the Mr. Caverhill who developed the fly pattern bearing the Caverhill name? 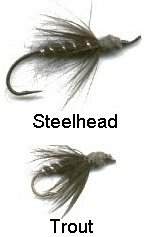 Thanks for a wonderful fly...when if first appeared in the issue of western fish and game back then, I immediatly sized it up to a mustad 36890 #2, and proceeded to angle up lots and lots of Bulkley River steelhead...I use the fly to this day, and it's as good as ever. Again, thanks for a winner!!! PS...in the trout size, it works good, too...but you already knew that. Regards, KD. The following history of the Helen's Heller was written by Williams Lake fly tier Paul Carnes, president of the Cariboo Chilcotin Flyfishers. The Helen's Heller is a fly that I use all the time. I have used it throughout the Cariboo-Chilcotin as searching pattern to find where the rainbows are. I have caught rainbows, brookies, char and salmon with it and it has a special place in my fly box as well as my heart. When I first came to Williams Lake in 1972 I was not a fly fisherman. Through friends I picked up the sport and the rapid loss of flies led me to flytying. I met Helen Peacock, the originator of the Helen Heller, while searching for a flytying class. Helen Peacock taught a evening course for Cariboo College but due to the limited number who wanted the course that year, it was cancelled. A group of us offered to pay her if she would teach us, which she agreed to do at her home. Every Wednesday night we would gather around her kitchen table, and she would pull out her suitcases of material and supplies and teach us the basic techniques of flytying, usually three flies a night, and how to fish them. We learned more on those nights than we would ever have, if we were in a classroom. The fly originated when she was tying professionly for Butterfield's in Kamloops. One of the principal ingredients is the use of seals fur, black and dark claret, which you mix together. This translucent material is what gives the fly movement and effectiveness. The rib can be silver or gold, the pheasant wing can be eliminated, but the shape and feel is what the basic design is all about. Helen Peacock said that it imitates a leech or dragonfly nymph. Either trolling or casting it is an effective fly and because of its historical roots in my flyfishing career it is special and one hell of a fly to use.